1. Many patients have complained to me that they don’t feel good or well in spite of taking medicine and doing various clinical tests. Their doctors just tell them that they are OKAY because the medical reports show NOTHING WRONG. In healing arts, we consider seriously what the patient claims about his or her ailments, and we take the trouble to explore the CAUSE/S. The complaint of the patient is called the INSTINCT. 2. Patients are normally given drugs or antidotes for each symptom they complain about. 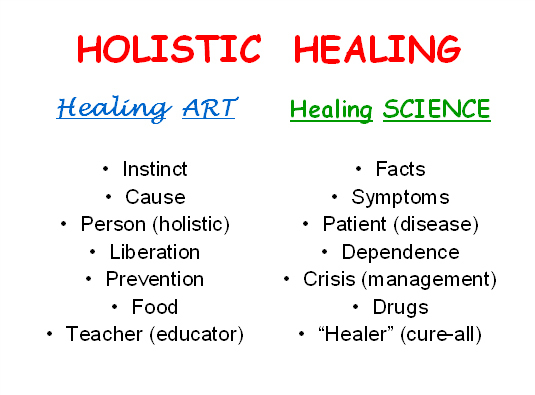 But in healing arts, we are more interested in the CAUSE of your ailment, for example, acidic stomach, skin eruptions, constipation, diabetes, etc. do not happen BY CHANCE. It is not an accident. They are lifestyle and nutrition related. 3. Conventional medicine talks about the PATIENT and the DISEASE, but in the holistic approach, we talk about the PERSON – mind, emotion and body altogether. 4. An average person is totally dependent on the doctor ( of any kind) for healing or cure. Our mission, on the contrary, seeks to teach people practical health knowledge and LIBERATE them to become “doctors” themselves. After all the ancient definition of “doctor” means a TEACHER. No big deal, really. The best prescription we give you is KNOWLEDGE. 5. The most important role of a TRUE doctor (of any kind) is to teach disease prevention in the first place, instead of asking for “what’s wrong with you?”, and thereafter prescribe medicine to relieve symptoms, or manage CRISIS situation. 6. “Let your food be your medicine, and medicine be your food”, so says Hippocrates around 350 B.C. He also says, “First, do no harm”. And to everybody’s pleasant surprise, this Father Of Medicine knew NO anatomy nor physiology during his time. He just used a few herbs and FOOD to heal people. Drugs, which are chemicals, can never heal a broken or degenerating body. That’s for sure. 7. REMEMBER THIS – a doctor at his or her very best should always be a TEACHER at heart. Never is or will a doctor be a “healer” because man works at it, but only God can heal. Praise the Creator God. NOTE: The Holistic Approach to Healing DOES use the resources of conventional medicine such as research information, diagnostics, medications, surgery, intervention, etc, as and when the situation WARRANTS such employment.